2015 ACL Music Festival Grant recipients. Park Adopter groups including Pease Park Conservancy, Friends of Murchison Pool, Austin YSML Sunshine Camps, North Austin Community Garden, Battle Bend Park, and Dove Springs District Park were awarded grants totaling $150,000. Austin Parks Foundation provides these grants as direct financial support to volunteers who have signed on as adopters , through the Adopt-A-Park program and since 2010, APF has awarded over $1,250,00 in grants to park improvement projects like renovations at Ramsey Park in 2014, and a new playscape at Ponciana Park in 2014. “Thanks to this grant from the Austin Parks Foundation, we’ll be able to kick start our first playscape, thereby increasing public participation in [Ponciana] park, promoting physical activity to the kids and families in the neighborhood, and helping to reduce crime by promoting positive use of the space,” said Alesha Larkin. “With the help of the Austin Parks Foundation, a small group of committed volunteers can accomplish many benefits for their neighborhood,” Larkin said. Past park projects have included everything from play equipment to park furnishings, tree planting, trail construction, invasive species removal and dog park improvements. Funding for the ACL Music Festival Grants Program is donated to the Austin Parks Foundation each year by the Austin City Limits Music Festival in order to maintain Austin’s parks and public lands. 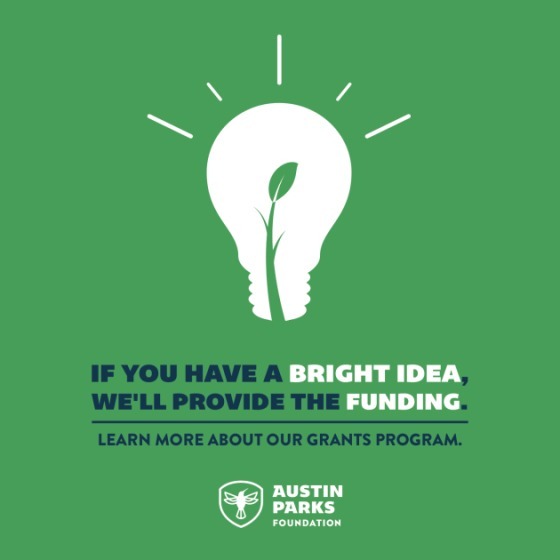 Founded in 1992, Austin Parks Foundation is focused on connecting people and parks through volunteer workdays, park improvement funding, educational workshops and more.